Both broad washes of light and tight punchy beams can be created using the new versatile Inno Color Beam Z7 and Inno Color Beam Z19 fixtures from ADJ. By combining the latest quad-color Osram Ostar LEDs with motorized zoom (producing a variable 10-60 degree beam angle), ADJ is offering lighting designers versatility with bright, powerful moving heads which can provide both intense shafts of light and wide-reaching wash effects. The more compact of the two new fixtures, the Inno Color Beam Z7, features seven powerful 10W quad-color (RGBW) Osram Ostar LEDs, providing users with an intense active beam or (using a wider beam angle) a far-reaching wash of light. This makes the Inno Color Beam Z7 ideal for use as part of a DJ or mobile entertainer’s dance-floor lightshow, while also being perfect for bathing venue features with atmospheric color. Equally, the fixture could be used for washing a stage at a church or as part of a touring band’s lighting setup, while also serving as an impactful moving beam effect. A large backlit LCD display, with four buttons, enables selection between the three operating modes – DMX Controlled, Sound Active and Show Mode – as well as easy control over DMX addressing. Multiple Z7 units can also be linked together for Master/Slave operation and both pan and tilt movement can also be easily inverted to give a symmetrical, synchronized professional-looking lightshow, without the hassle of DMX programming. The inversion feature can also be used to set up two fixtures – one of the floor and the other hung from above – so that they both move in the same direction. 64 built-in color macros enable users to easily select the right RGBW mix to achieve a particular color, which aids quick programming. The fixture, which offers 220-degree tilt and 540-degree pan, uses stepper motors with micro stepping to allow 16-bit fine pan and tilt control; giving users greater precision when it comes to movement and positioning. The unit also offers 0-100% digital dimming as well as variable speed strobing and strobe pulse effects. 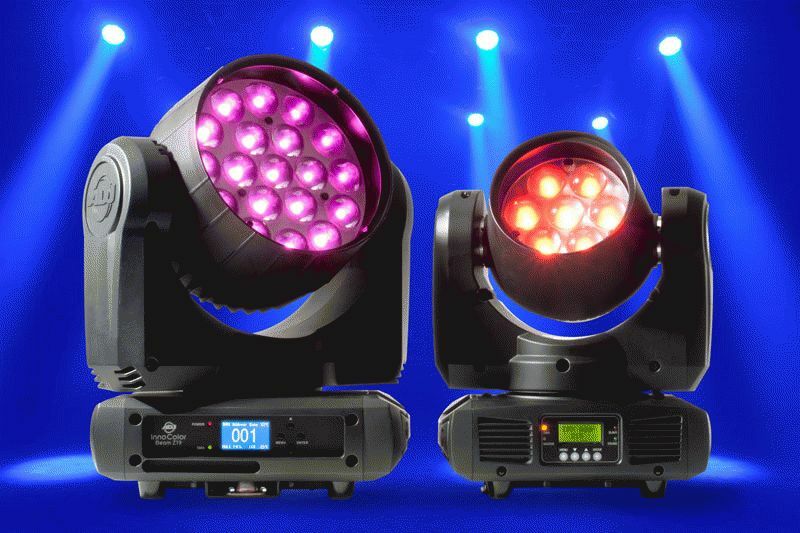 These features make the Inno Color Beam Z7 ideal for clubs and touring acts (as well as mobile DJs, due to its compact size) in situations where a multi-functional fixture is needed to provide an active lightshow but also to allow a wash effects to cast a wide-reaching glow across the stage or dance-floor. IEC in/out connectors also mean that the power supply for multiple fixtures can be daisy-chained (4 at 120V or 8 at 230V) safely to reduce the number of cables needed to setup a lightshow. Similar features are offered by the Inno Color Beam Z19, but with nineteen quad-color Osram Ostar LEDs, rather than seven, the fixture offers even more powerful and far-reaching effects. The same motorized zoom, but a larger fixture overall, means that the beam of the Z19 can be manipulated to provide either a thick, solid shaft of light or a wide-reaching wash effect. When the beam angle is tighter, the Z19 is perfect for providing the kind of fast-moving beams effects which are on-trend for concert tours and the current EDM scene – great for creating an atmosphere in large venues with a young-adult demographic of clientele. Furthermore, due to the likelihood of these larger fixtures being mounted both hanging from above on a lighting rig and sitting on the floor of a stage, the LCD menu features a 180-degree inverse mode. This ensures that users can easily see the menu to select options and change DMX settings no matter which way up the unit is positioned. The fixture also features both 3-pin and 5-pin XLR in/out sockets allowing it be incorporated into a DMX system using either type of XLR cables. Professional PowerCON input/output sockets – which lock into place to ensure cables aren’t accidentally pulled out – are provided to allow multiple fixtures to run from a single power source (up to 5 at 120V and 11 at 230V). The uniquely-versatile ADJ Inno Color Beam Z7 and Z19 are the perfect moving head wash solutions for any mobile entertainer, touring act, club or house of worship that needs a fixture capable of washing a stage or dance-floor as well as filling a room with penetrating colorful beams. Due to ADJ’s use of innovative Osram Ostar LEDs and motorized zoom these adaptable fixtures offer both precise color beams of pure lighting excitement and powerful, far-reaching wash effects. This versatility and exclusivity doesn’t have to come at a price, either; the Inno Color Beams will wash away worries – without breaking banks!